Click on the links below for scores, ladders and other details for all of our teams. Here's the link for the Moonee Valley Firsts through to the Sevenths, and our juniors. Click the link for scores, ladders and all the details. Click on this link for a map showing the ground locations at Fairbairn Park. For an aerial photo, click here. Our Juniors and three senior teams play in the North West Cricket Association. Click this link to go to the North West Metropolitan Cricket Association site. Link to the Cricket Victoria site. 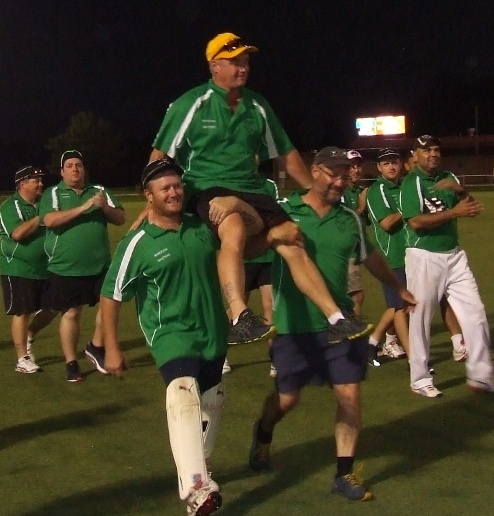 Link to the Victorian Turf Cricket Association site. Link to the Mercantile Cricket Association site. Link to the Victorian Women's Cricket Association site. Above: Sean O'Kane is chaired off at Barooga by his brothers Peter (left) and Mark. 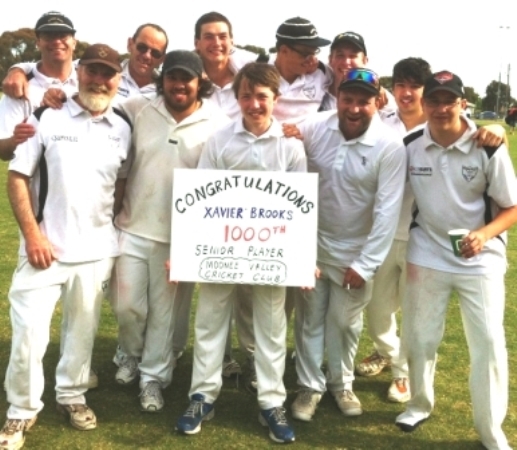 Below left: Moonee Valley's 1000th player, Xavier Brooks, took to the field in the 2012/13 season. He's shown here with his team-mates in the Fifths.